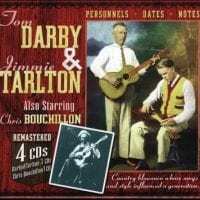 By all accounts Tom Darby and Jimmie Tarlton were an acrimonious duo, thrown together more by opportunity than any pressing desire to play music together, but in spite of the tension between them (or maybe because of it), the body of work they recorded together for Columbia Records between 1927 and 1933 is as singular and distinctive as any in early country or blues. Both were fine guitar players, with Darby generally handling the lead vocals and Tarlton the harmonies, but the difference-maker was Tarlton's striking slide guitar style. Tarlton played with the guitar in his lap Hawaiian-style, and reportedly fretted it with a wrist pin from a car. His slide lines give everything the duo recorded an eerie, exotic presence that, coupled with their impeccable vocals, makes them utterly unique. 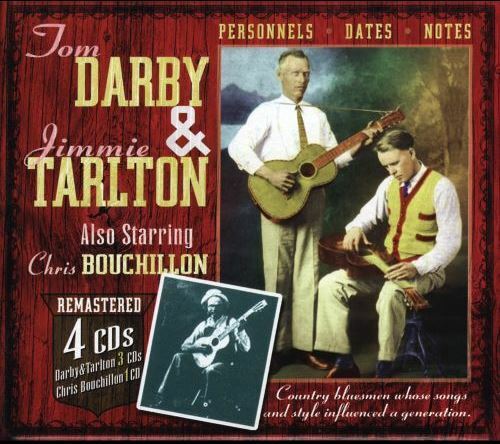 Darby & Tarlton played rags and waltzes and other popular dance forms of the day, but their bread and butter was always the blues, and when you hear people say that country music started as the white man's version of the blues, the tracks collected on this four-disc set from JSP Records are exactly what they're talking about. Among the obvious highlights here are the duo's version of "Going Down the Road Feeling Bad" called "Down in Florida on a Hog," the sublime "Birmingham Town" (which borrows its melody from "Jesse James"), their version of Dorsey Dixon's "Weaver Blues," the fun "Ooze Up to Me," the familiar melody of "Roy Dixon" (Roy Acuff would borrow it for his "Great Speckled Bird"), and "Birmingham Jail" and "Columbus Stockade Blues," which were a two-sided hit for Darby & Tarlton, selling some 200,000 copies on 78, an impressive sales figure for the time. Ironically, the last song the duo recorded was "Let's Be Friends Again," when it was doubtful the two ever had any great affection for each other. The final disc of this set collects Chris Bouchillon's late-'20s recordings for Columbia Records. Bouchillon was an unlikely recording star, since he wore conspicuous glasses, seemingly always had a pipe in the corner of his mouth, and by most reports was an awful singer. He had a subtle sense of humor, however, and a horn man's sense of timing when he talked, and he single-handedly invented the talking blues form with the release of "Talking Blues" in 1927 (it had actually been recorded a year earlier). Tracks like "The Medicine Show" and the hilarious "I've Been Married Three Times" show that if Bouchillon wasn't a great singer, he was a master of timing, and his talking blues keep you waiting always for the next line, for the next shoe to drop. As a box set, these four discs show the deep influence of Afro-American blues forms on the creation of early country music, and while Tom Darby, Jimmie Tarlton, and Chris Bouchillon are hardly household names outside of the old-time music community, their influence is pervasive and far reaching, if not always recognized or acknowledged.